Dusit Garden was the brainchild of King Rama V. Inspired by his European tour in 1897, King Rama V envisioned a new palace with a difference. To achieve this vision, farmland between the Padung Krung Kasem and Sam Sen Canals was bought to site the second palace. A royal boulevard, Ratchadamnoen Avenue, was built in 1899 linking the Grand Palace to the site of the new palace, four km away, which was named Suan Dusit or Celestial Garden. Construction on the new palace started in 1900. The result was the magnificent Dusit Garden. Later renamed Dusit Palace, it was actually a huge palace complex consisting of 13 royal residences and three throne halls set in wide beautiful gardens. Covering an area of approximately 76 hectares or 190 acres, it's about the size of 50 soccer fields! Let's take a bird's eye tour to appreciate the expanse and grandeur of this palace complex. Please map to the garden. 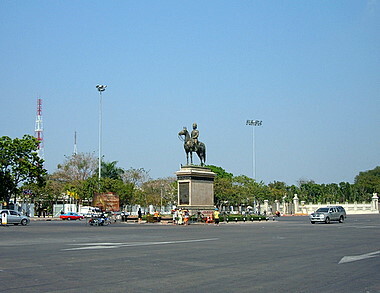 Approaching Dusit Garden from the south along Ratchadamnoen Avenue, the visitor arrives at the Royal Plaza, a broad avenue with the King Rama V Equestrian Monument in the center. Every year during the King's Birthday celebrations on 5 December, contingents from battalions of the King's Guard Troop the Colour here in a grand parade to honor the King. In the background stands the Ananda Samakhom Throne Hall a majestic Italian architectural masterpiece at the end of Ratchadamnoen Avenue. This throne hall was completed in 1915 and housed the Thai parliament after the 1932 coup when Thailand changed to a constitutional monarchy. Behind the Ananda Samakhom Throne Hall, at the heart of Dusit Garden, lies the crown jewel of the palace complex, the Vimanmek Mansion. 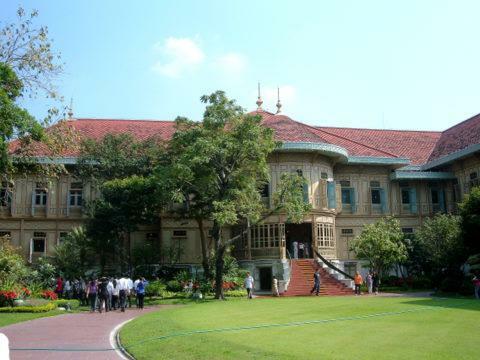 This mansion was the residence of King Rama V. It's the largest golden teak mansion in the world. Construction started in 1900 and the mansion was completed on 27 March 1901. Nearby is the Abhisek Dusit Throne Hall built in 1904 to receive high-ranking dignitaries; the hall has an exquisite display of traditional Thai arts and crafts, sponsored by the royal foundation under the patronage of HM Queen Sirikit. East of the beautiful gardens of the Ananda Samakhom Throne Hall along U-Thong Nai Road is the former palace garden Khao Din Wana which was presented by King Rama VIII to the people in 1938 and converted to a public zoo, the Dusit Zoo. This accounts for the reduction in land area. No visit to a royal palace is complete without a visit to the royal stables, in this case the Royal Elephant Stables which is now the Royal Elephant Museum displaying the history and origins of the white elephant. 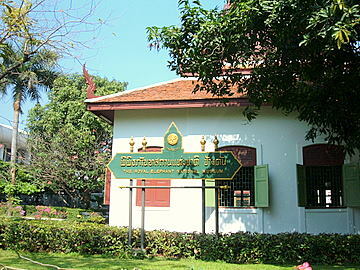 The museum is near the east entrance in U-Thong Nai Road. Near the south entrance in Sri Ayutthya Road is the Suan Kularb Residential Hall and Throne Hall, home of Prince Asdang Dejavudh, son of King Rama V.
In the western sector of this palace complex are several residential halls some of which are in traditional Thai architecture. 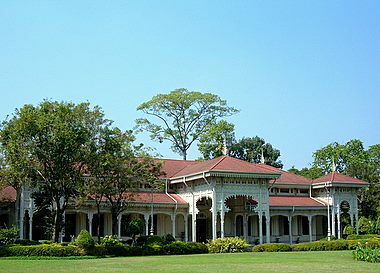 Suan Si Rue Du Residential Hall was the former residence of Queen Saovabha. The hall displays a royal collection of the gifts to HM King Bhumibol on the 50th anniversary of his ascension to throne. Suan Bua Plew Presentation Hall has a multi-media presentation of Dusit Garden, useful for visitors who want an overview of the history and exhibits at the various places before deciding where to visit. There are also a number of smaller buildings in this palace complex that used to be homes of members of the royal family. Today, these buildings have been converted to museums preserving special aspects of Thai art, culture and royal mementos. Visit these Royal Residential Halls for some very interesting displays. 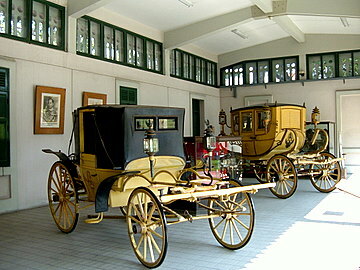 The Royal Carriage Museum near the north entrance has on display 13 royal carriages used by King Rama V.
There are four entrances to Dusit Garden. Tour groups usually use the north entrance because of the parking available. So this entrance is more congested. The southern approach via U-Thong Nai Road, the Royal Plaza and the Ananta Samakhom Throne Hall is the traditional approach and also the most impressive. It gives the visitor a sense of grandeur of the palace complex. 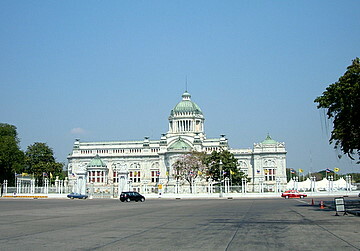 Walk around the Ananta Samakhom Throne Hall to the east entrance U-Thong Nai Road. This entrance allows the visitor the shortest route to the major attractions, Vimanmek Mansion and the Abhisek Dusit Throne Hall. Opening hours for Dusit Garden are everyday from 09:30 am – 03:15 pm. Admission is 100 bahts. Dusit Garden is one of the most beautiful districts in Bangkok in terms of historical and cultural relics. The garden captures the splendour of life in the royal palace during the reign of King Rama V.